Setting up at the Royal College ahead of our workshop. 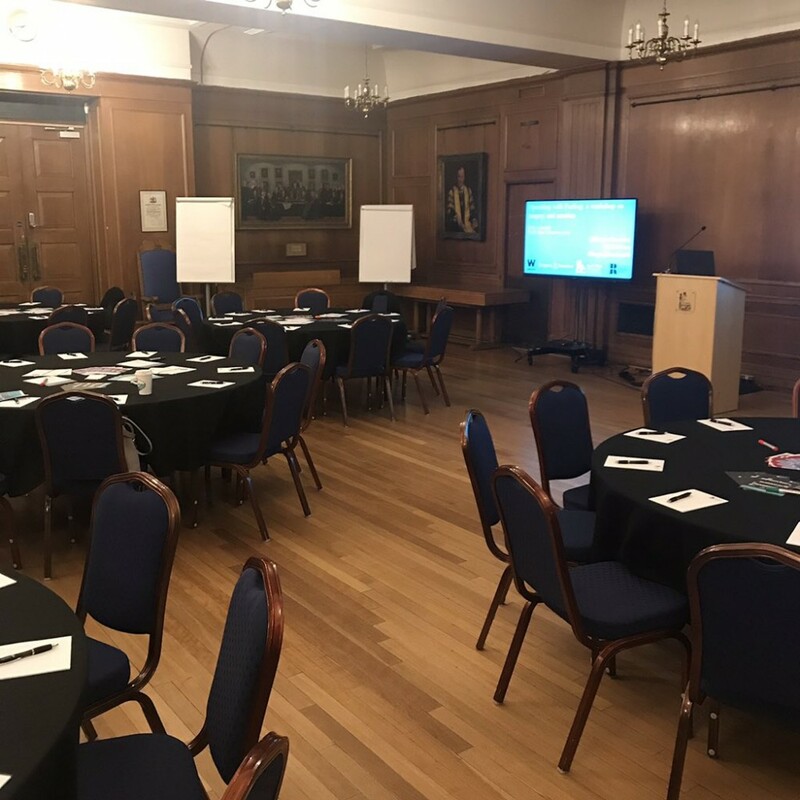 The Surgery & Emotion team collaborated with the Royal College of Surgeons of England (RCS) to organise ‘Operating with Feeling’, an interdisciplinary workshop exploring the role of emotions in surgical practice. Held at the RCS on 1 June 2018, the event brought together surgeons and other healthcare practitioners, historians, and policymakers to discuss the emotional experiences of surgery, past and present. The event was divided into three sessions, each interrogating different emotional issues affecting surgeons: Stress, Burnout and Bullying; Anxiety, Doubt and Grief; and Compassion and Sympathy. Each session opened with a panel, featuring informal, bite-sized presentations. (You can listen to these as podcasts via our SoundCloud playlist here.) 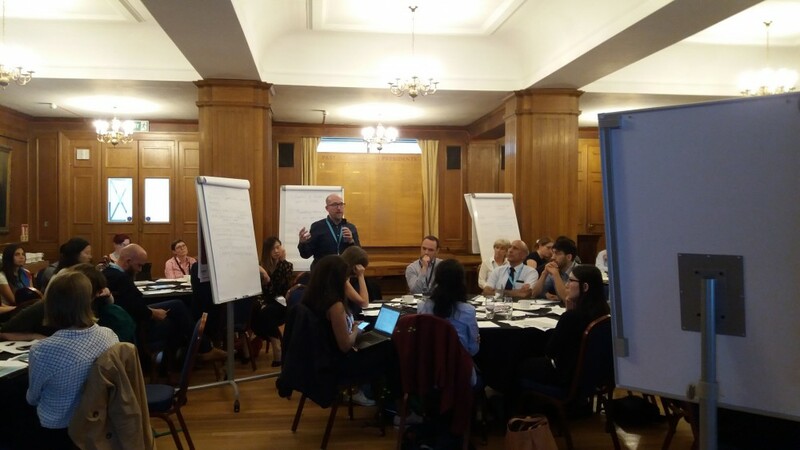 The presentations were followed by Q&A and then a breakout discussion where delegates explored the issues in more depth, considering opportunities and challenges in surgical training, practice and patient care. Our first panel looked at bullying and mental health in the surgical profession and NHS workforce. Urology trainee Alice Hartley spoke about her work as Chair of the Royal College of Surgeons of Edinburgh’s campaign against bullying in surgery, reflecting on bullying behaviours and the surgical persona. Next, trauma and orthopaedic registrar Simon Fleming explored the relationship between workplace culture and bullying, discussing the #HammerItOut Campaign spearheaded by the British Orthopaedic Trainees’ Association. Lastly, Richard Jones, Clinical Director of the NHS Practitioner Health Programme, spoke about mental health and stress, probing the idea of ‘burnout’ which has become so ubiquitous in discussions of the NHS workforce. The second panel – on anxiety, doubt and grief – shifted attention away from relationships between members of the surgical team, and towards practitioners’ emotional connections to their patients. Sally Frampton, Postdoctoral Research Assistant at the University of Oxford, discussed anxiety and doubt in nineteenth-century surgery, using the innovative and risky operation, ovariotomy (or the removal of the ovaries), as a case study. The Chief Executive of the Point of Care Foundation, Jocelyn Cornwell, talked about ‘Schwartz Rounds’, reflective practice fora which provide opportunities for staff to reflect on the emotional aspects of their work. She gave moving accounts of surgeons coping with grief and unexpected patient death. 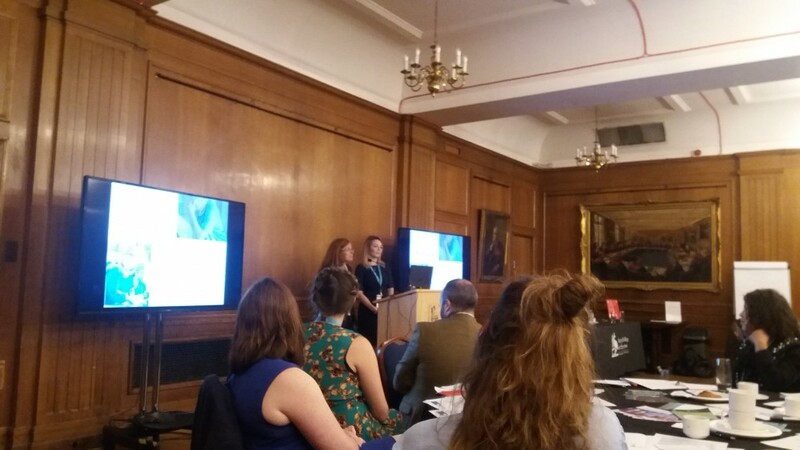 Finally, Siné McDougall and Catherine Johnson, from Bournemouth University’s Surgeon Wellbeing project, presented their research on surgeons’ responses to adverse events such as complications and errors. Siné McDougall and Catherine Johnson present findings from the Surgeon Wellbeing project. The final panel of the day explored compassion and sympathy. John Collins, Professorial Fellow in Surgery at the University of Melbourne, discussed the value of compassionate care in surgery both past and present. Rose Glennerster, Junior Doctor at the Royal United Hospitals in Bath, talked about ‘compassion fatigue’ and reflected on whether surgeons could have too much compassion for their patients. The former RCS Director for Professional Affairs for the East of England, Surjait Singh, spoke about his work for the BMA’s Doctor Support Service, which supports surgeons undergoing GMC investigations. He called for greater compassion within the surgical community. Finally, Michael Brown, our Principal Investigator, reflected on what surgeons today can learn from cultures of compassion in the early nineteenth century. In the final session, RCS Council member Scarlett McNally chaired a keynote presentation on ‘The Humane Surgeon’ from retired vascular surgeon Averil Mansfield, who was the UK’s first female professor of surgery. We were delighted when Mansfield praised the workshop as a ‘unique event’ in the history of the College, which bought much-needed attention to the lived experience of surgical practice. Drawing on her own experiences and illustrious career, Mansfield spoke about shifting public perceptions of surgery, the links between altruism and professionalism, and the importance of group dynamics in team working and good communication with patients and their families. She described the challenges of deciding when not to operate and the importance of humane decision-making and leadership. Throughout the day, breakout discussions centred on recommendations for change. Rather than focusing on high-level policy ‘asks’ (such as funding and resourcing), we asked delegates to devise interventions that could take place at grassroots or trust-level. Look out for our upcoming article in the RCS Bulletin, which will examine these recommendations in more depth. Project PI Mike Brown feeds back from a breakout discussion group. In brief, much of the conversation focused on how to improve the emotional health of NHS staff by making them feel valued and helping them to develop supportive working relationships. Delegates argued that a more compassionate community amongst staff would enable surgeons to develop better relationships with their patients. Delegates also recommended alterations and adaptations to the hospital environment. They suggested that fora for socialising, like mess parties and team lunches, would help break down hierarchies and boundaries between clinical and managerial staff. Staff need spaces where they can take time to process difficult or emotionally intense events. In terms of tackling bullying, some attendees recommended further training on workers’ rights in relation to harassment. They also suggested that emotional health and effective communication should be compulsory elements of CPD rather than optional add-ons. In discussing how to ameliorate grief, anxiety, and doubt, delegates suggested that Schwartz Rounds should be rolled out across the UK. Participants also recommended the creation of ‘Emotional Firms’ – collections of surgeons from different specialties and career stages in different teams who come together regularly to talk about the social and emotional aspects of their work. Existing Morbidity and Mortality meetings could also be restructured to allow time and space for emotional reflections, not just clinical commentary. Finally, we considered how compassion and sympathy might be curtailed by time restraints. Some mentioned experiencing difficulties in attending Schwartz Rounds, while others talked about the challenges of giving patients adequate time to express themselves within brief consultations. They also reflected that compassionate care is a form of emotional labour often taken on disproportionately by women and that it should be distributed more evenly among colleagues. Our evaluation of the event revealed that participants particularly appreciated the ‘interdisciplinary’ nature of the workshop, ‘the breadth of topics and speakers’, and the mix of presentations and discussions. One respondent commented that it ‘felt productive having time to discuss ideas’, while another liked that there were ‘helpful solutions and not just problems raised’. We asked attendees what they might do differently as a result of attending. One said they would be ‘more sympathetic to medical practitioners in hospitals’, while another said they would ‘look at myself more often to ask if I am a bully at times’. Asked for their thoughts on the value of historical perspectives on surgery and emotions, one respondent said these showed ‘how cultural norms and assumptions have become embedded in the surgical encounter. We have [to] understand these if anything is going to change!’. Another said that a ‘contextualised historical account of emotions […] helps to dismantle inaccurate stereotypes and can provide catharsis for those who have struggled with the acceptance and role of positive and negative emotions’. One of our respondents remarked that future events could include ‘perspectives from other members of the operating team’, such as nurses and anaesthetists. The importance of team-working was a major theme coming out of the workshop and we’re already planning a follow-on event that will involve more people from the NHS workforce in dialogue about emotional health. Watch this space for details!